Since I’ll be baking a blackberry cobbler tonight for a friend, I’ve got dessert on the mind and thought I’d share some of the cakes I’ve made recently. I had a last minute order for a birthday cake this past weekend that was fun to do, as I was given carte blanche in regards to the filling. I used my beloved vegan Lithuanian white cake for the base, soaked the layers in a homemade lemon simple syrup, and enrobed it in a fresh strawberry icing. Because I was short on time, I opted to decorate it with strawberries and candied lemon slices, leftover from the lemons I used for the simple syrup. My jadeite cake stand is one of my favorites, and it always looks good with pink icing! The best part about cake-making is leveling the tops – delicious scraps for days! I inevitably have leftover icing, as well, so makeshift cake sandwiches are made frequently. I’ve yet to use the scraps for cake pops, as I’m still on the fence about those. I know that sounds weird, but THEY seem weird to me! The client I had before this one had requested a cake with a bohemian theme, with fresh flowers. She also wanted the white cake, but with fresh raspberries for the filling and icing – this happens to be my favorite combination, so I was quite eager to make it and lick the spoon! She also wanted a bit of the “naked cake” look, so the icing wasn’t applied on it too thickly. We have “treat day” at the station each year which encompasses delicacies of both the savory and sweet variety, and, naturally, I bring some kind of dessert. Last year I made a vegan dark chocolate yule log, but this year I decided to go with something a little simpler, and made a gingerbread cake with cream cheese icing and candied cranberries. We are savages at work when it comes to food, so the cake was gone within an hour, at best. Last, but not least, I made a dark chocolate cake for my former 😦 co-worker’s birthday. I don’t really like chocolate cake, and because I think they all taste bad, I can never gauge whether or not mine are okay, haha. Still looking for that perfect chocolate cake recipe, so if you’ve got one, PLEASE send it my way! Inspired by one of my friend’s love for violet-flavored candies, I’ve got violet simple syrup on the mind now, and am thinking of making that the star of my next cake. I’m also leaning toward a slightly tart, slightly sweet grapefruit and poppy seed cake – doesn’t grapefruit curd sound so good?! *extra credit if you get the title’s reference! This entry was posted in baking, cake, cooking, Delicacies, dessert, flowers, food, lifestyle, living, photography, pink, spring, vegan, vintage and tagged baking, cake, dessert, flowers, food, homemade, photography, pink, spring, vegan, vintage on April 4, 2017 by thebostonrose. Before continuing to write about my PDX trip, I want to share with you some of the goodies I’ve been making! As a slight chill has begun to whisper its way into the season, it has moved me to create some warm dishes, full of rich color & flavor. I’ve been particularly fond of using fresh rosemary in both savory and sweet fare this past month. Having a kitchen stocked full of fresh herbs makes daily cooking even more enticing! Root vegetables have taken center stage for me this Autumn. After enjoying a summer full of beet and peach caprese, it’s now time to slice up the beets -golden & red- and roast them with garlic, sweet potatoes, and carrots. I’m a big enthusiast of “eating your colors,” and there’s no better way than a jewel-toned dish like this one! Toss with fresh sage, parsley, oregano, and rosemary, and you’ve got some beautiful and delicious side dishes. An added bonus-they are completely vegan options! Another pantry item I can never have enough of is olive oil. From sauteeing a mirepoix for soups and sauces to drizzling as a final touch on top of tomato pies, olive oil is one of those perfect ingredients that brings a recipe together. Not only that, it’s one of the healthiest fats you can eat! Nourishing for your hair, heart, skin, cognitive abilities, etc, it’s just about an ideal food. Root vegetables don’t have to be just roasted to be enjoyed – I’ve been using them for cozy soups, as well. I enjoyed a homemade parsnip soup in Michigan last Christmas, and decided to try my hand at my own version. This one included carrots, sweet potatoes, and apples, spiced with fresh ginger, tumeric, thyme, & roasted pepitas. Served with a steaming cup of mint tea (also fresh from the garden! ), it’s an excellent meal to serve up on a grey, rainy day. What’s a dinner without dessert? I always, always have room for something sweet, no matter how big the dinner! I’ve been really in the mood for brownies lately, and instead of brightening them up with mint or orange, I made some with rosemary and sea salt. The recipe I found for these makes a chewy, wonderfully dense (I am not fond of cake-y brownies) brownie that surprises you with it’s hint of chili powder. Drizzled with dark chocolate and sea salt, the flavors compliment each other amazingly well. I did worry that the rosemary would make them taste…weird…but it was actually a pleasant surprise! The rosemary and chili powder heighten each other’s flavor profiles, while the dark chocolate balances them with it’s rich sweetness. These were dairy-free but they did contain eggs. I haven’t tried making them with an egg substitute yet, so if you do, let me know what works best! I really, really love the art of food – from the act of creating something delicious to sharing it with others. It doesn’t matter how tired I am after a full day of work, I still love to go home and immerse myself in the soothing process of making something from scratch. The change in the weather brings about a welcoming change in the process, too. It can be a little more complex as we begin to fill our refrigerators full of comfort food rather than the summer’s simple, freshly picked fruits and veggies, but the dishes created quietly warm your bones and your soul. Plus, who isn’t enticed by one’s kitchen becoming an indoor garden, those lush herbs begging to be eaten? *props to anyone who gets the title reference! This entry was posted in baking, cooking, Delicacies, dessert, fall, food, garden, herbs, holiday, lifestyle, thanksgiving, Uncategorized, vegan and tagged baking, beets, cooking, delicacies, herbs, vegan, vegetables on November 20, 2015 by thebostonrose. It’s been a whirlwind of a year since my last post in March, with an abundance of change. As the dust has finally (finally!) settled, I can now get back to posting about our adventures! Rosie and I have had to endure a great amount of sadness but received so much support through these challenging months. I look forward to sharing with you my trip to the Pacific Northwest, with stops in Portland and Olympia – including a stay at the most perfect Airbnb, and replete with Boston Terriers! I even got to meet Lucille Marie of The Pawsh Puppy! The Autumn air is beginning to reach that perfect cooler temperature, and I’m taking advantage of it with lots of walks, foraging for the perfect pieces of moss and mushrooms, creating soul-warming soups (butternut squash and parsnip! 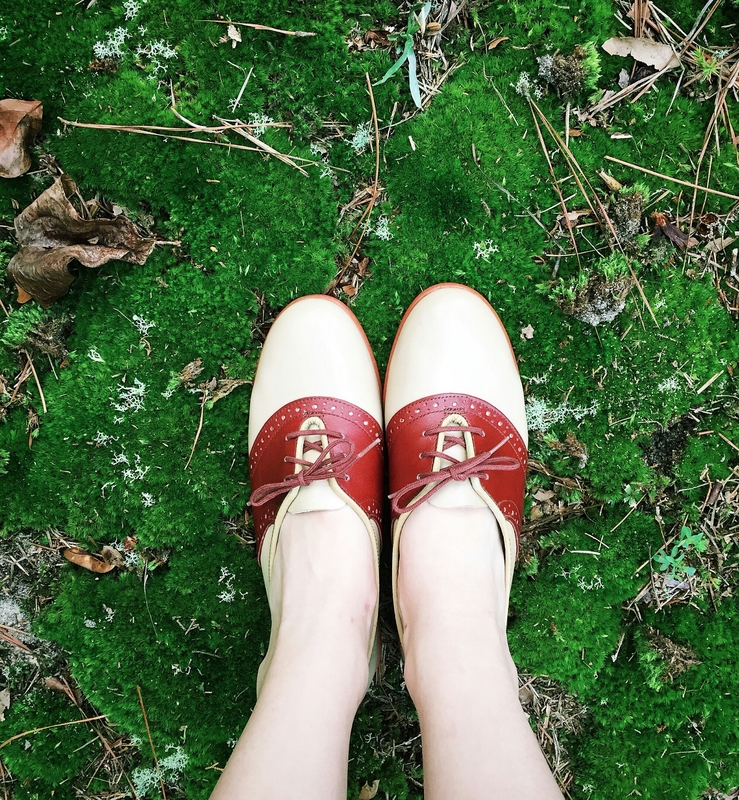 ), and roller skating in my vintage skates for a little extra exercise, followed by soothing and meditative yoga sessions. There are lots of surprises in store in the coming months, as well – I can’t wait to share them all with you! Until then, be on the lookout for some new vegan recipes, a tour of Portland & Olympia, and lots of beautiful wares and clothing from my favorite makers and shakers! This entry was posted in Boston Terrier, cooking, dogs, fall, garden, gardening, olympia, photography, portland, products, shoes, shopping, Travel, vegan and tagged autumn, Boston terrier, cooking, dogs, fall, nature, Olympia, pnw, Portland, shoes, travel, vegan, vintage, vintage style on October 14, 2015 by thebostonrose. In the past few years, I’ve grown fonder of cooler temperatures. While I still love to bask in the hot, sultry summers, I’ve been finding a sort of symmetry in embracing crisp winters. I love feeling the brisk air on my face, the bundling up in coats and scarves, and most of all, the coziness that the winter brings. Because my sweet Matt hails from Canada and his immediate family lives in Detroit, I’ve learned the special art of couch and blanket sitting. It involves a lot of staying in, the perfect ratio of blankets to person, and usually a hot beverage, preferably with a little something “extra” added to warm you even more. These days, the weather has been perfect for cozying up on the sofa and re-watching episodes of Twin Peaks, like we have been doing. It’s also been inspiring me to bake more, as the sweet scents wafting from the kitchen just add to those magical holiday feelings. This week, I decided to try my hand at shortbread, a cookie that I had actually never made before. I slightly adapted a recipe from Vegan Cookies Invade Your Cookie Jar, by Isa Chandra Moskowitz and Terry Hope Romano, THE ladies when it comes to vegan baking, and hot damn! They’re so good! I chose to make lavender shortbread, as I have a bunch of organic lavender that’s been begging to be used. 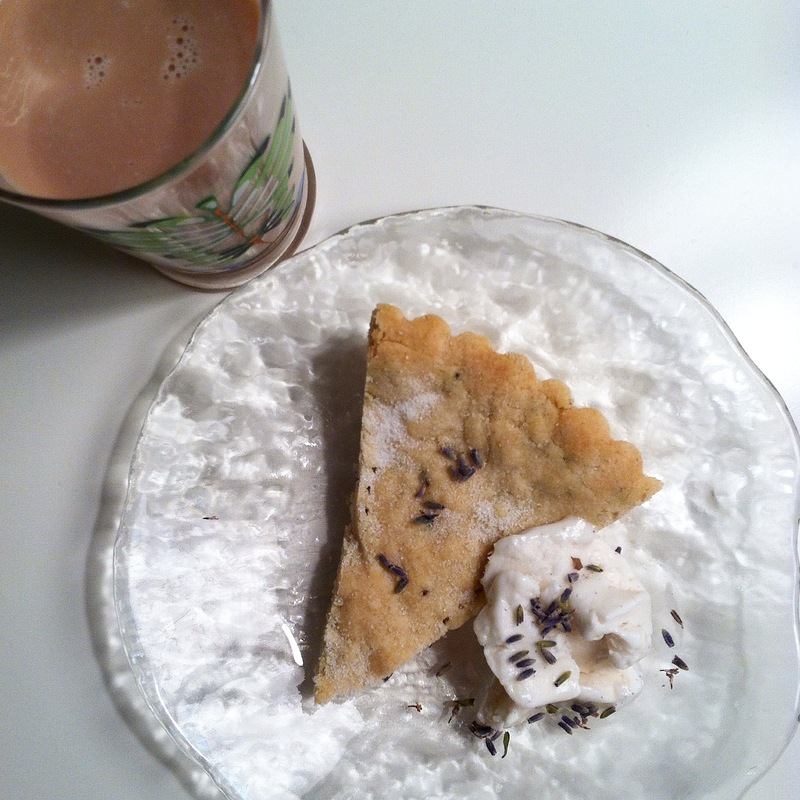 Lavender can be a tricky flower to bake with, simply because so many people are adversed to the taste. (Or think they are!) What is so great about this recipe is that you can really taste all the layers of flavoring, as well as the textures. The floral, slightly anise-y flavor of the lavender hits your palate first, but then fades away to the familiar sugary vanilla that we all know and love. Combined with a crunchy, then chewy texture that eventually melts in your mouth, you wind up with a childhood favorite that has evolved to an elegant adult. Pair it with a glass of rich chocolate almond milk (hey, I didn’t say you had to ACT like an adult! ), and you’re good to go. And with that, bring on the cold weather, a comfy couch, and a plate of warm cookies! I’m ready for ya! 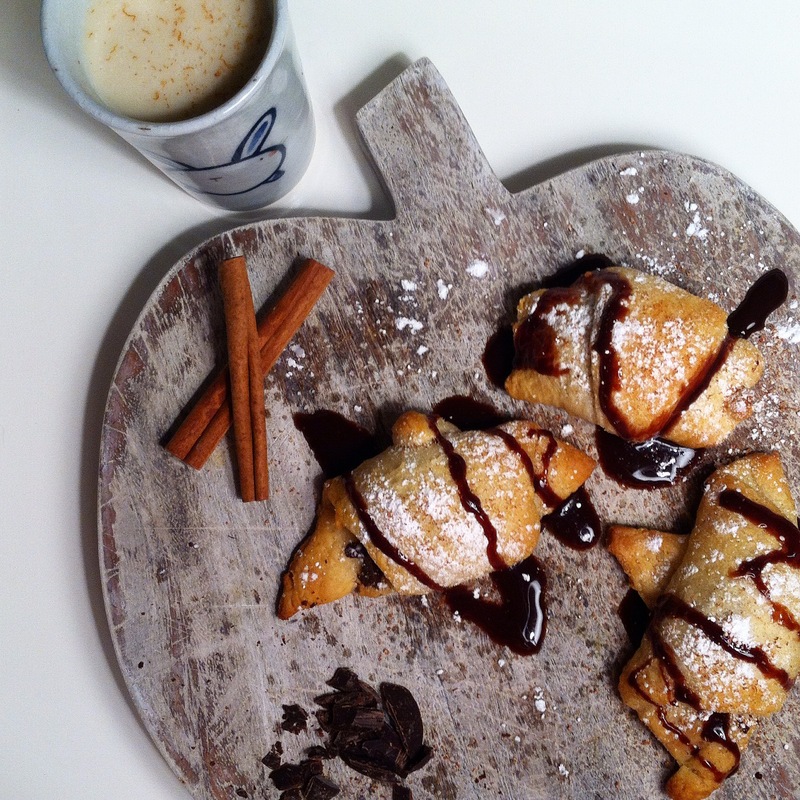 This entry was posted in aromatherapy, baking, Canada, cookies, cooking, Delicacies, dessert, detroit, food, holiday, vegan, winter and tagged baking, Canada, cookies, cozy, delicacies, Detroit, holiday, lavender, shortbread, vegan, warmth, winter on December 12, 2014 by thebostonrose. Rosie and I hope everyone had a wonderful Thanksgiving yesterday! We’re plant-based in this family, so we enjoyed a delicious, guilt-free, vegan feast. My darling Matt and I spent a leisurely afternoon cooking at my parents’ house, taking our time to make everything from scratch, and catching a few glimpses of the parade. Because Matt is Canadian, this was our second Thanksgiving celebration, the first having been in October for him. ‘Tis the season for root vegetables, and we’ve been cooking a lot of them, and specifically, beets. I absolutely despised beets growing up and refused to give them another try until just a few years ago. My friend, Rebecca, and I were at one of our favorite local haunts, The Bee’s Knees, a couple of summers ago, where she was happily eating a beet & peach caprese. The dish was certainly pretty- ruby red beets, luscious peaches, crumbled goat cheese, and fresh basil, all drizzled with balsamic vinegar. She encouraged me to try it, saying she makes the same dish and promised that I would at least love hers when she made it for me. This was before I went fully vegan again, so I summoned up all my courage and picked up my fork. She was right- it was perfect. Thus began my love affair with beets. I had always felt like a bad Lithuanian, not staying true to my heritage’s adoration of this hearty vegetable, and now I am pleased to say I feel worthy of my Eastern European genes once again! My dad has always loved them, so now he can no longer tease me or try to trick me into eating them! So, yesterday, we roasted beets, and I sautéed the greens in balsamic. If you have never cooked the beet greens, you absolutely must next time (as long as they look fresh and green). They’re so delicious and full of nutrients. It’s also a plus when you can use the whole product in a meal. Balsamic vinegar and garlic played huge roles in our dinner this year. We had an ample supply of garlic and since Matt and I are big fans, we used it in just about every dish. He roasted purple baby potatoes with a simple combination of garlic and olive oil, while I roasted cabbage (again, with the Lithuanian heritage), in garlic, olive oil, and balsamic. I also tossed some whole carrots in an orange, brown sugar, and balsamic mixture, having been inspired by EverKind‘s Thanksgiving blog post. 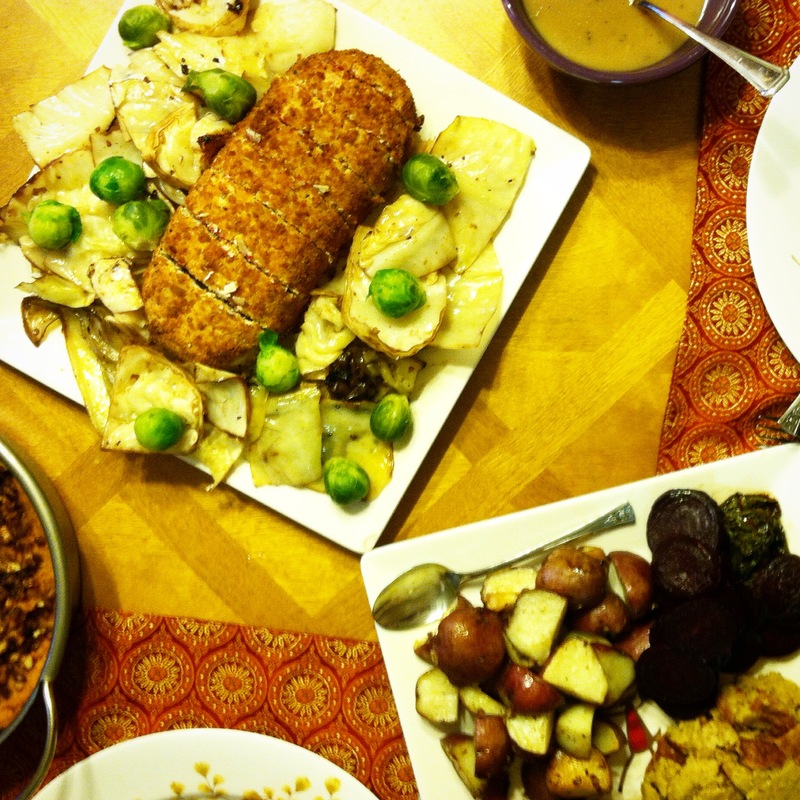 We rounded out the meal with my special sweet potato soufflé, my mom’s dressing, Brussels sprouts, and a surprise vegan loaf with mushroom gravy that my mom had gotten for us. Needless to say, we have lots of leftovers, some of which I partook in for lunch today! I’m usually the self-professed Queen of Baking, but was so into cooking the meal this year, I ended up not making a dessert. I definitely felt weird not having anything sweet to produce! I’ve been feeling a little under the weather today (another Thanksgiving tradition and one I’d be happy to get rid of), but that hasn’t stopped my craving to bake. EverKind shared a quick and easy recipe for Holiday Dessert Rolls, and not wanting to exhaust myself even further by making a big production out of dessert, I decided to give this time-saver a try. The best part? I never knew that Crescent Rolls are vegan! I grabbed a can of them at the store, the chopped up some semi sweet chocolate, grated some cinnamon, sliced up a banana, and baked at 375° for 11 minutes. Topped with a sprinkling of powdered sugar, a little more grated cinnamon, and a drizzle of some Ah-Laska chocolate syrup- voilà! Paired with some soy nog spiked with cinnamon, my sweet tooth has been satiated. But I wasn’t the only one to have a nice holiday- Matt made sweet Rosie a special plate of scrambled eggs (she’s not vegan 😉 ) as a treat last night- she’s such a lucky lady! And with that, the holidays are officially here! What are you looking forward to the most this season? This entry was posted in baking, cooking, Delicacies, dessert, family, food, holiday, photography, vegan and tagged baking, cooking, delicacies, dessert, food, holiday, photography, styling, thanksgiving, vegan on November 29, 2014 by thebostonrose.